Slippery Karst enters the battlefield tapped. Well, the tri-lands EtBT but I can see their versatility and benefit in the following turns, so I can see why you may want to keep them. The cycle from the Ravnica sets if played during the 2nd main phase can ramp in the next turns, so they also have a purpose. 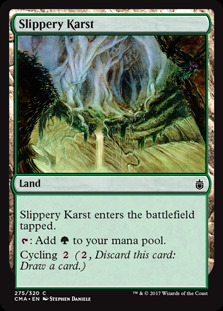 I can also see the point of having something like Slippery Karst that you can cycle for drawing. The lands I would replace are those that do not provide any (significant) trade-off for letting you one turn behind in terms of ramp (e.g. Highland Lake , Stone Quarry , Akoum Refuge , etc.). The first alternatives that come into my mind are shock-lands (e.g. Hallowed Fountain , Steam Vents , etc.) and/or pain-lands (e.g. Adarkar Wastes , Underground River , etc.). I would also take out Rupture Spire for something like City of Brass or, considering you have a lot of multicoloured creatures in the deck, Guildmages' Forum . The main drawback of course is that such manabase is more expensive in terms of real-life money. Seedborn Muse pretty ridiculous in this shell. Myriad Landscape helps thin deck. 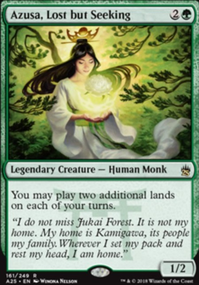 May be overkill but if Azusa gets hated on you could use Exploration, Burgeoning or Wayward Swordtooth to help get extra lands. 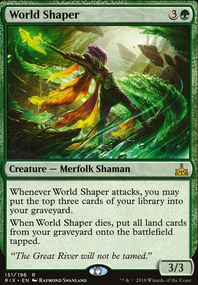 Worldly Tutor or Chord of Calling could find your Ramunap Excavator and you could use more utility lands to abuse Azusa further, like activating and sacking and replaying to repeat multiple times. Field of Ruin, Wasteland, Tectonic Edge, Buried Ruin, Scavenger Grounds for example. Treat lands like extra spell spots. You can easily replace like 10 Forest with utility lands. And of course lands like Temple of the False God, Slippery Karst. Evolving Wilds and Ash Barrens over the Fetch lands. Alright, it seems the deck is a bit top heavy. Here are my suggestions. I have structured this rework of the deck to sac and get the mana out quick till you can have Meren stay on the board long enough or just hard cast the big things. You don't have to take my suggestions but I highly insist that this will make her work again. 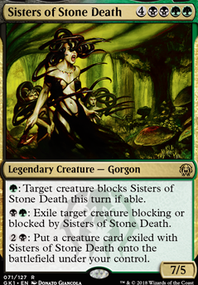 Like many of us I'm sure, I'm considering a Muldrotha, the Gravetide build and came across an interesting conundrum. I'd almost certainly not run the less efficient Blasted Landscape and with Ash Barrens and Fetid Pools occupying a different sort of design space (and basically being shoo-ins!) I wondered about the pros and cons of the others. costing // OR // OR raises the question of what is the most useful or most efficient, whether indeed they all have a place. I like the idea of the deck a lot! 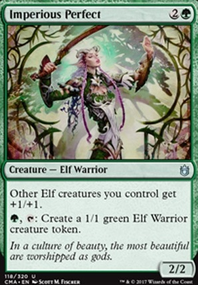 :D I think you should try to improve the mana curve though, most of your creatures have a very high cost, so you might not be able to use them when you need to. Also, some cards don't seem like they would be very useful in this deck for example, Ishkanah, Grafwidow Vedalken Orrery and Subterranean Hangar, and in some cases, could even be counter productive, like with Gleancrawler (or Nighthowler, Lord of Extinction and Bonehoard depending on your strategy) These cards cost too much, and don't do enough to help your deck. I'd also replace lands like Barren Moor, Slippery Karst and Tranquil Thicket with their basic land counterpart.